"Hunger is not a supply problem, it's a distribution problem." 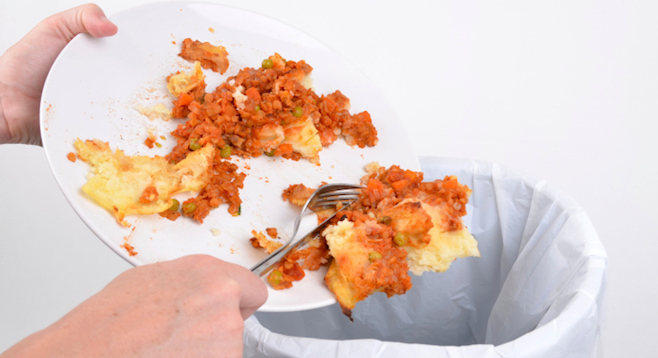 San Diegans waste an estimated billion pounds of food annually. At an event on Tuesday, October 6, organized by the San Diego Food System Alliance, a crowd of food and waste professionals shared their roles in solving the problems in our local supply chain and explored opportunities to work together to reduce waste and solve hunger. "We have about half a million food-insecure people in the county," says Victory Gardens San Diego co-director Richard Winkler. "And coincidentally, we waste half a million tons of food every year. And that number's conservative — we've seen estimates much higher." Put another way, Winkler notes that low estimate indicates San Diegans are wasting a billion pounds of food annually. Meanwhile, local food banks and other programs that feed at-risk populations say they're coming up short of filling their needs by about 27,000 tons — roughly 5 percent of the total waste amount. "When we think about hunger, people who are food insecure, we think about populations in Africa…we don’t often think about our neighbors," said Dr. Dean Sidelinger, child health medical officer for the county. But, “County by county, in Southern California we have some of the highest rates of food insecurity for children nationwide." Food-waste problems, panelists say, don't stop with good food being thrown out that could be used to feed those in need. A full 25 percent of the nation's water use, Winkler says, goes toward producing edibles that will end up in landfills. As much as 40 percent of all food produced goes uneaten, and that waste comprises 15 percent of the contents of local landfills. "Organic materials create all the problems in the landfill," said Michael Wonsidler, a coordinator for the county's Solid Waste Planning & Recycling Section, responsible for overseeing a state-mandated 50 percent landfill-diversion rate. "You've got methane that's generated when food waste degrades," for example. Wonsidler adds that decomposing food, which is mostly water, leaches down through toxic materials, releasing chemicals into underground water supplies. He says that diverting food from landfills for use in composting and energy generation gives the waste a new life and helps avoid some of the toxic conditions it creates in dumps. A case study at the Ramona Unified School District was shared, wherein food waste was reduced dramatically — a fifth was cut out by preparing smaller batches of school meals; the same reduction was achieved again by distributing unused stock to food banks before it spoiled. Another third of the waste was used to feed livestock, which had the added benefit of reducing animal-feed bills by half. Chuck Voelker, representing San Pasqual Valley Soils and the Frank Konyn Dairy, shared a similar story. Cows from the dairy are fed items that would be considered waste to humans but still contain valuable nutrients for animals, including waste from bakeries and spent grain used at breweries around the county. The manure then travels to the soil farm, where it's converted into compost for re-use in local gardens. Environmental Protection Agency representative Andre Villasenor shared an EPA-prepared online tool kit he said could reduce household food waste (and bills) by up to a quarter. Rick Nahmias of Los Angeles–based Food Forward mentioned how he'd taken the idea of "backyard harvesting," or arranging volunteers to pick and donate fruit from homeowners whose trees were producing more than they could consume, and grown an enterprise that has reclaimed more than 13 million pounds of food that would have otherwise spoiled. Local groups CropSwap San Diego and Harvest CROPS had booths at the event promoting similar practices locally. "Hunger is not a supply problem, it's a distribution problem," Nahmias said. Chuck Samuelson, founder of Kitchens For Good, explained his business model of reclaiming cosmetically unappealing food and using it to prepare meals for vulnerable county residents, employing and providing job training for members of the same communities. "We'll take squishy tomatoes that food banks can't distribute and turn them into tomato sauce. We want to take bruised apples and turn them into apple pie, apple jelly, something — keep it in the food system," said Samuelson. "We think this is a very good time to end hunger and food waste in the county," says Winkler, referring California's AB 1826, a law that will incrementally force the commercial sector to begin diverting organic waste away from landfills. "There is really no such thing as waste. Everything we waste is a resource, especially food," concludes Winkler, a sentiment echoed by several other speakers throughout the afternoon.